Louis McLane Morris (1837-1877) was born in Delaware and when the Civil War broke out he was commissioned as a lieutenant into the 4th New Jersey Militia on April 27, 1861. He served throughout the war in the 4th, 6th and 8th New Jersey Volunteer regiments. All these units saw service as part of the Army of the Potomac and Morris saw service with that army from the battles of Williamsburg to the siege of Petersburg, Virginia. Included here is a war-date, ca. 1864, carte de visite of Morris in his captain's uniform. This image bears the photographer's imprint of J. Cremer & Co., Philadelphia on the verso. Minor spotting affects the image, else overall VG. Morris ended his service in the Civil War by raising to the rank of major as commander of the 8th New Jersey. Seemingly, he enjoyed soldier life and remained in the army and from the end of the war until his death in 1877 saw service in the 20th United States Infantry. Items from his service in the Dakota Territory include a, 4" x 6", sepia tone photograph of Morris in uniform; an embroidered pillow style insignia, measuring approximately 1.5" round, from one of Morris' epaulettes bearing the numeral 20 in a field of blue; a cabinet card of comrade 2nd Lt. Frank Xavier Kinzie, in uniform and holding a riding crop, identified, in period ink, on the lower mount "Lieut. Kinzie of 'Ours" and a partly-printed card, with Army & Navy Club of New York logo, 5.5" x 3.5", September 28, 1874, informing Morris that his name was placed on the list of visitors admitted to privileges of the club for two weeks. With Army & Navy Club envelope addressed to Morris. Finally, we have an albumen photograph, on an approximate 10" x 8" mount, ca. 1870, identified in period ink as: "Officers Quarters, Lower Brule Agency, Dakota," with Morris's quarters indicated on the right. Morris died suddenly on April 7, 1877 while on duty in the Dakota Territory and many in the military, and civilians alike, were deeply saddened by his untimely death. 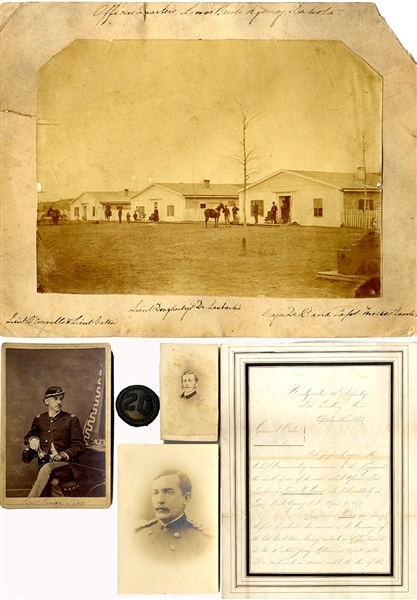 Here we have his military eulogy issued by his commander Col. George Sykes and addressed to Morris' wife, 2pp., 4to., "Headquarters 20th Infantry, Fort Snelling, Minnesota, April 14, 1877," General Orders No. 1", with multi-hand drawn black borders, reading, in part: "With profound regret the Colonel commanding to the Regiment, announces the death of one of its most valued officers, First Lieutenant Louis M. Morris, who died suddenly at Lower Brule [Fort Hale] Agency D. T., April 7, 1877. Lieutenant Morris was among the first to volunteer…at the beginning of the late Civil War…he was an actor in all the principle battles of the Army of the Potomac and was wounded at Williamsburg, Chancellorsville, and Spotsylvania…during his service with the 20th Infantry…he earned for himself the reputation of a thorough soldier…by command of Colonel George Sykes…". Signed and made official by John B. Rodman as 1st Lieutenant and Adjutant 20th Infantry. Also included in the group are two war-date CDVs of Bvt. Brig. Gen. Timothy C. Moore and Sgt. Major Carl Moser of the 8th New Jersey, both men appear in civilian clothing; a 4" x 6" sepia tone photograph of Morris' wife, Lydia Higbee Morris and numerous CDVs, cabinet card and tintype of his children including two (2) Spanish-American War era images of his son in military uniform. The paper items have the usual folds some toning, overall very good while the image compare similarly. Included are numerous pages of biographical information.